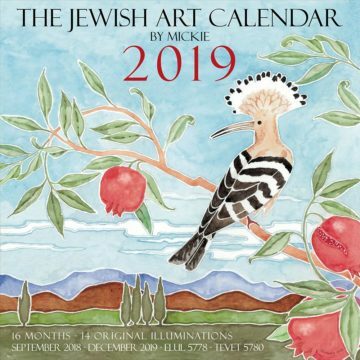 Mickie Caspi creates wonderful new images every year to fill The Jewish Art Calendar. 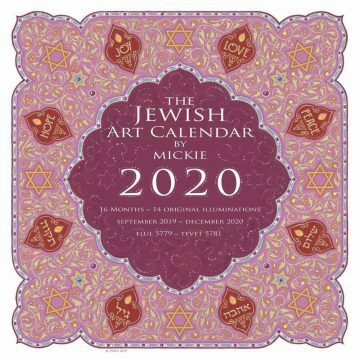 The 2020 version is a hanging wall calendar that covers the 16 months from September 2019 through December 2020, corresponding to the Jewish year from Elul 5779 through Tevet 5781 (Sept 2020–Dec 2020 appear on one page). Candle-lighting times, weekly Torah portions, Jewish holidays, and national holidays (U.S. and Canada) are all listed. Large boxes provide needed space for busy families to mark in everyday events. Each illumination has an informative description that adds meaning to the artwork itself. 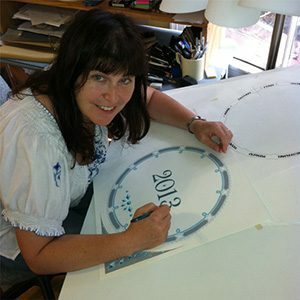 All of this creates a beautiful and practical work of art that can be enjoyed for 16 full months.